Unlike other migrants, refugees face unique challenges that prevent them from realizing their full potential in schools. Therefore, integrating refugees in the host country requires strong support mechanisms some of which are provided non-profit organizations. Refugee support initiatives may provide educational reinforcement and valuable support to help refugees foster positive education outcomes. This chapter examined how programs offered by non-profit organizations that support refugees in one of the Midwestern states in the U.S. reduce barriers to refugee students' high education outcomes. The results indicate that, through collaboration, non-profit organizations provide a wide range of refugee support services such as enrolling kids in school, support to students with disabilities, and a variety of after-school and summer programs. These services help refugee students, manage their traumatic experiences, integrate into schools, to be self-sufficient, and provide a safe learning space thereby cushioning them against barriers that limit their success in school. As of 2015, the American Immigration Council estimates about 43.3 million foreign-born individuals resided in the United States (American Immigration Council, 2017). These include voluntary immigrant families seeking better economic conditions, and refugees fleeing war and/or other atrocities. People who voluntarily migrate see migration as an investment and a path to better opportunities (Tani, 2017), which is not the same for refugees. Regardless of their socio-economic status, refugee often start at a position of social disadvantage and they face unique challenges that prevent them from realizing their full potential in schools. For instance, they may lack preparation for basics of elementary education, face challenges in learning English, challenges in balancing differing value systems of home and school, and may lack the needed support in bridging dual cultures (Rong & Brown, 2002; Hall et al. 2017). Therefore, integrating refugees in the host country requires strong support mechanisms some of which are provided non-profit organizations in the host country. The non-profit organizations provide an array of services for refugees and other vulnerable people such as food, water, shelter, legal advice, education, and healthcare. Much of the work in the United States has been done to examine the challenges for immigrant and refugee youth in formal school programs (Morse, 2005; Rotich, 2011) and how schools can address the needs of immigrant and refugees (Birman, Tricket & Bacchuss, 2001). However, other immigrants don’t face similar challenges as refugees. Immigrants choose to reside in a different country on a voluntary basis and have had time to think about their choice (Cowart & Cowart, 1993, 2002 as cited by McBrien, 2005). They often arrive after years of preparation, such as locating housing, securing jobs, and already have become somewhat familiar with the language of the host country (Dijkshoorn, 2016). Refugees, on the other hand, are forced to leave their country because of violent circumstances and poor living conditions. Moreover, post-migration experiences, like their resettlement in the United States, can be a negative experience. Many refugees are poor and have few possessions, and have to deal with long resettlement procedures (Dijkshoorn, 2016). What kind of support do non-profit organizations provide to refugee students? What do program staff belief helps improve students’ education outcomes? To what extent are refugee students’ parents and guardians involved? What challenges do the organizations face in providing these services? Immigrant Population: Consists of persons residing in a country but born in another country. 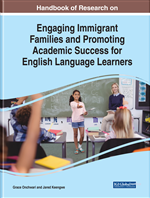 English Learners: Students who are unable to communicate fluently or learn effectively in English, who often come from non-English-speaking homes and backgrounds, and who typically require specialized or modified instruction in both the English language and in their academic courses. Traumatic Experience: An extremely disturbing incident that causes physical, emotional, or psychological harm. Local Education Agency: A public board of education or other public authority legally constituted within a state for either administrative control or to perform a service function for public elementary schools or secondary schools in a city, county, township, school district, or for a combination of school districts or counties that is recognized in a state as an administrative agency for its public elementary schools or secondary schools. Asylum Seekers: Individuals who have sought international protection and whose claims for refugee status have not yet been determined, irrespective of when they may have been lodged. Resettlement Agency: Refers to an organization that has contract or cooperative agreement with the Department of State or other Federal agency to provide reception and placement services to newly arrived refugees in the United States. Convention: Binding formal agreement drafted by international bodies such as United Nations. In order to become functioning and applicable law a convention has to be ratified by countries, which means that they first sign it and then fulfill their own national legislative requirements.